Christmas Eve is just one of my favorite days. Christmas seems like it is FINALLY here, yet it's still *not* here. Anticipation is in there, lots of fun traditions, etc. I just love it! The night before Christmas Eve, Matt convinced me to open one of my presents. I realllly didn't want to, but he reallllly did, so I gave in. I'm glad I did! We saw a commercial for a Griddler by Cuisinart a while ago, and we both fell in LOVE. Well, Matt hung on to that thought and bought me one for Christmas! Christmas Eve morning I was PUMPED to try it out - french toast for everyone! This thing was a beast and worked wonderfully! While the kids napped, Daddy had to put together LL's big Santa gift: a princess bike! We had a feast for dinner! 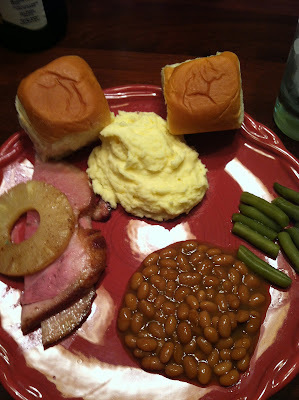 Ham, green beans, mashed potatoes, baked beans, and bread! Super yummy! After dinner, we had to make cookies for Santa! Poor Coop was sleeping (again!) - haha. One day he'll get to enjoy all of this! 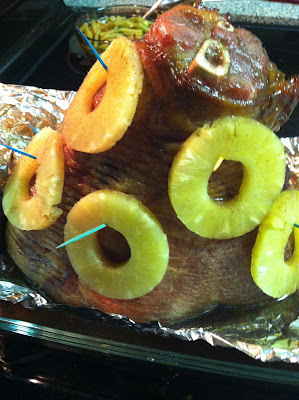 Ready to go in the oven! I know - my cookie sheets have seen better days! LL was SO excited to put the cookies and milk out for Santa! We also had to put out some carrots and water for Rudolph. Somehow, we miscommunicated on how Santa actually works. LL kept saying that she did NOT want Santa to come in her room - haha. 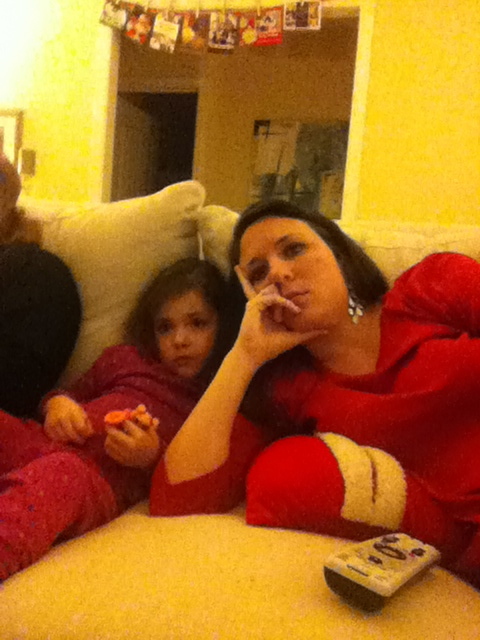 Another Christmas tradition: we HAVE to watch the old school "How the Grinch Stole Christmas" right before bed. It was SUCH a fun day. While LL started understanding what was going on last year, she was still missing out on a lot of the details. This year, she understood it 100%. It was a blast!